National Federation Party Opposition MPs Biman Prasad and re-elected party president Tupou Draunidalo. The National Federation Party yesterday re-elected Tupou Draunidalo as the party president and Parmod Chand as vice-president. 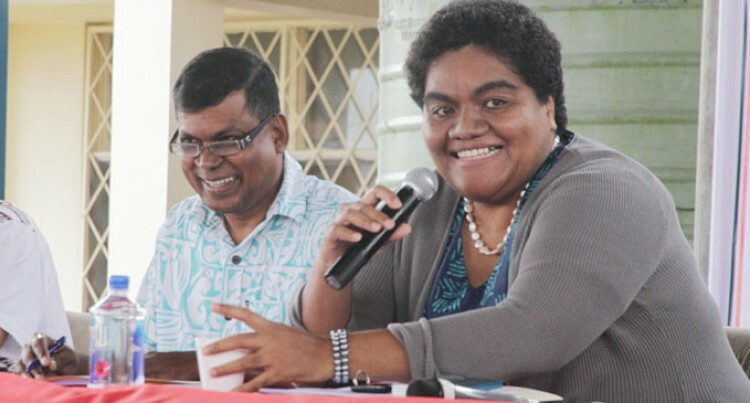 The election was done at their small delegate’s annual general meeting and convention at the Tamavua Primary School in Suva yesterday. Under the Political Parties (Registration, Conduct, Funding and Disclosures) Decree 2013, all registered parties must have their AGM and conventions annually. Around 50 to 60 delegates made their way to the AGM from all over the country, where they unanimously re-elected Ms Draunidalo as its president and Mr Chand as its vice-president. Party treasurer is Dalip Kumar and Bala Dass has replaced Kamal Iyer as the general secretary.